I’m all for bringing back old Dodgers for nostalgic reasons. They brought back Matt Kemp last year and I had all the feels. But this one is hilarious. 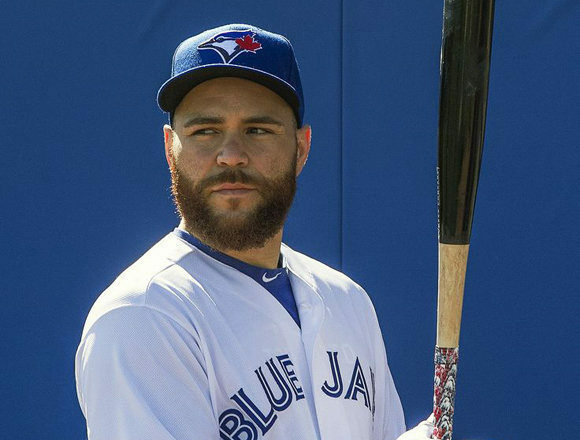 The Dodgers and Blue Jays have reportedly reached an agreement to send former Dodger Russell Martin back to the Dodgers. We don’t know who is headed back to Toronto in the deal so stay tuned for more updates. (UPDATE) apparently it’s Ronny Brito and Andrew Sopko going back to Toronto in the deal. So we now have our answer as to who will pair with Austin Barnes behind the dish in 2019 and it’s not good folks. Martin is due to earn 20 million dollars in the final year of his contract this season. He’s here for one year guys and then probably off to free agency again or retirement. That 20 million could have resigned Yasmani Grandal, but hey Andrew Friedman you know. Looking at Martin we can fondly remember him making his MLB debut for the Dodgers way back in 2006. During that time George W. Bush was still president and the Dodgers were owned by slimy Frank McCourt. Clayton Kershaw hadn’t been drafted yet I believe and Matt Kemp was also a fresh faced rookie. It was a long time ago. Martin’s tenure ended with the Dodgers back in 2010 when he oddly injured his hip while running the bases. If I remember correctly he broke or tore it and was out for the remainder of the season. That winter the Dodgers did not tender him a contract and he left for Pittsburgh, never to be seen or heard from again. Well the problem is Martin is 35-years old and hasn’t had an above average season at the plate since 2015. In 2018 for the Toronto Blue Jays he batted a paltry .194 while hitting 10 home runs and getting on base at a .338 clip. I guess he can still do that, get on base, but anything else has gone long ago. 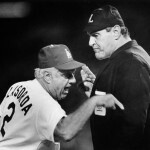 I still vividly remember former Dodgers manager Joe Torre trying him at third base and it was a total disaster. He does have 50 career games there as well as 4 at second base and 3 at shortstop. He’s also played a few games in the outfield too. Good times. I hate having to say I told you so to anyone here, but you know….I know how Friedman works by now and can see his moves coming a mile away. I was correct on all fronts here with this Dodgers catching situation. I predicted the Dodgers would not be resigning Yasmani Grandal and they didn’t. I predicted they would not be trading for JT Realmuto and they haven’t. I also predicted that any catcher they acquired would be a sub-mendoza line hitter. Martin will fit in with the other .190 hitting catcher Austin Barnes. Now the Dodgers have two Mendoza line hitting catchers. Happy Days! The Dodgers painted themselves into a corner here. They were desperate for a catcher and the Blue Jays, a rebuilding club sensed this. The Jays wanted to dump salary (something the Dodgers are familiar with) and the Dodgers just needed someone, anyone with a pulse to catch. I mean I like Martin, always have but man this is brutal. Welcome back to Los Angeles Russ! Welcome back to LA, PED Pusher. Still owed $20M? don’t make me choke…. You are lucky there is no Border Wall at the Canadian Border. Scott, they did not dump salary. They sent a lot of cash back to the Dodgers, well not cash, but they are picking up a lot of Martin’s salary. What I read is anywhere from 12 to 16 million. He is owed 20 million. So, no salary dump on Toronto’s part. They have eaten well over 40 mil so far if you count Tulo’s 38 mil that they ate. Sopko and Brito going back to the Jays, thins out the prospects some as ol Andy continues his dumpster diving tactics. Andy really had to scour his spreadsheets to find a catcher who actually hit worse than Barnes last year. Perception is a tricky business. Those who are prone to whining will whine when something happens that doesn’t fit their idea of what is supposed to happen. Hijacking the future with bloated, multi-year contracts, is not the way Friedman and much of the league wants to operate any longer. Most of you are stuck in old ways of thinking and are so reactive to anything that challenges these ideas. The Dodgers supposedly already have their catcher of the future. He happens to still be in the minors and is not thought to be quite ready to join the team. They don’t want to rush the process so they need a stop-gap, something that will suffice for this coming season and will not have repercussions for the future that will handcuff them and make it more difficult for their farm system to grow players that will be able to join the team. Ruiz seems to be the anointed future catcher. A little more patience and no significant long term contract is how they are preparing the way for him. This team can probably withstand weak batting at the C position for the time being in return for defense. Can Barnes be any worse as a hitter than he was last season? Most people think, NO. We will see. Belli, Muncy, Seager, & Turner, offer a load of power for the infield alone. With a change of batting strategy and tactics, the Dodgers could turn the tables and become something much more than an all or nothing club, which was the fans biggest complaint last season. We have no weak positions other than C at the plate. We have a solid defense with a starting rotation that is proven. The bullpen has been strengthened and they now have two back to back WS appearances with which to draw from. It won’t surprise me if the Dodgers are picked again to win the West and the NL. I’m not saying they will as there are many factors such as injury that will affect the fortunes of all teams, some of them actually become better faced with ill-fortune. This whining that is dominant on this particular board is not attractive and reminds me of teenagers not getting their way. This is a big boys game. Do you hear the players whining and complaining about their teammates and coaches? Jeff completely agree with you. The Dodgers are actually run by some very intelligent people. The NEW MLB philosophy greatly espoused by Dodger Management is a sane one, which is, build your team with draft picks and great coaching at the Minor League level. Control costs, enhance profits, and pick up help when needed by way of trade or free agency. Think of it as the Atlanta Brave Business Plan which by the way worked but now Kasten has more money and I think a better ownership. The Dodgers have by everyone’s agreement three very good young catching prospects in Smith, Wong and Ruiz why should they spend top talent to trade for a good but not incredible catcher. Realmuto is a very solid guy but he is not a Piazza. Posey or Bench. Strictly a move by FO to cash in on nostalgia…. but not a wise move. With the young catching prospects, AND a young veteran in Barnes, I would have picked up AJ Ellis when he was availible. He settled for $1.5M with “Madres”. He would have been a great mentor to the young Dodger catching squad, and much cheaper then J. Martin. There are also a lot of AJ Ellis fans too, who would have the same nostalgic impact at the gate as J. Martin. Offensively, I think J. Martin is a risk. His numbers are worse than Barnes… feast or famine. Defensively, nothing exceptional. AJ has the veteran experience to stay within his lane, and do, offensively, what is expected of him as a catcher, as far as situational, clutch hitting, protecting the pitcher’s spot. Defensively, he is a proven field commander, who can gain the confidence of his pitchers to call a good game, and keep the defense on their toes.